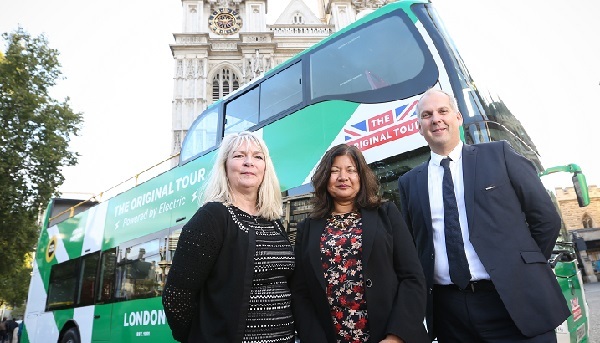 The move, welcomed at the unveiling by London deputy mayor for environment and energy Shirley Rodrigues, sees the green-coloured double-decker deployed on the Original Tour’s Yellow route. The company says the vehicle represents the first step in bringing zero-emission sightseeing to the capital as London mayor Sadiq Khan plans the world’s first Ultra Low Emission Zone (ULEZ) to start next April, some 17 months earlier than planned. The Original Tour is a subsidiary of RATP Dev, part of public transport specialist RATP Group. RATP Dev worked with four industrial groups in Europe to design the electric bus, which was launched at a ceremony in Paris in April. The Original Tour says it will gradually convert its buses to zero-emission models as part of its fleet renewal programme, with three more electric vehicles planned during next year.